Dimensions: height 10.4 in. and diameter 8.4 in., height 26,5 cm. and diameter 21,5 cm. Comes with Anti-stress light! Maintenance free (no filters to change); low-energy consumption; 99% efficient in destroying most airborne pollutants; Ozone free & Ion free. Eliminates dust mites, bacteria, mold spores, viruses, pollens, pet dander, ozone and other microorganisms from the air. 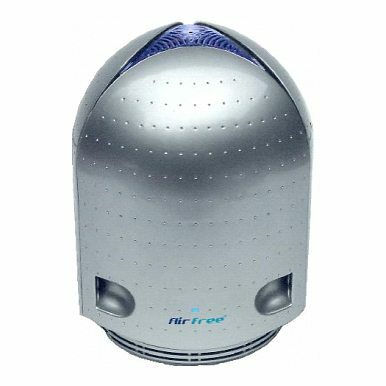 Airfree applies the same concept as boiling water in using heat to destroy microorganisms and attains 100% efficiency at the Airfree air outlet. The entire process is completely silent and requires no maintenance, not even the occasional replacement of parts. The TSS (thermo-dynamic sterilization system) technology destroys all airborne microorganisms at temperatures of close to 400 °F. Internationally certified microbiology labs and universities have tested Airfree and all confirmed its extraordinary efficiency. All you have to do is switch the device on and leave it to get on with the job. Airfree's exclusive and patented Thermodynamic Sterilizing System (TSS) technology has been independently tested in “real life” working conditions by world renowned institutions and ISO 17025 laboratories in six different countries including the USA, Sweden and Germany. These tests prove that Airfree totally destroys up to 99.99% microorganisms that pass through its patented TSS, no matter how small or hazardous they might be. Airfree offers a detailed copy of the independent tests on its website www. airfree. com assuring consumers of Airfree's outstanding efficiency in drastically reducing airborne microorganisms. The problem comes in the air that you breathe, even at home! Approximately 90% of our time is spent in internal environment where air contamination can reach as high as 100 times the level found in streets. The air in our homes is replete with microorganisms harmful to our health including the mold, dust mites, viruses and bacteria responsible for a series of diseases and respiratory allergies. Through exclusive technology, Airfree naturally eliminates up to 99.99% of microbiological air contamination and thus guaranteeing you far better air quality. We make sure we intake only filtered water and food meeting the highest quality standards. Why, therefore, do we not similarly pay attention to the air that we breathe? Of everything that we ingest throughout our days, 99.94% is air. Airfree allows you to choose to breathe better at home just as you also make choices about what you eat and drink. Using Airfree is no luxury but rather an essential good. Airfree emits no ozone. The Airfree TSS technology generates no dangerous emissions, NO ions, NO UV light and NO ozone. In fact, independent tests in laboratories in Sweden demonstrate that Airfree actually reduces ozone by 26%. Ozone is a toxic gas that according to the EPA (Environmental Protection Agency) can trigger asthma and destroy lung tissue.